ready to serve your real estate needs. 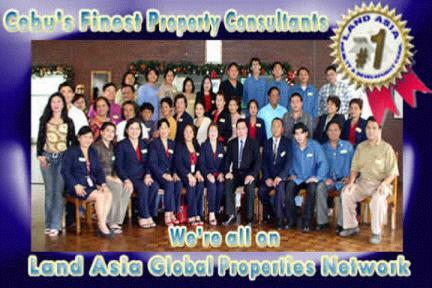 For an accummulated thirteen years experience of selling real estate properties and providing local expertise especially in the brokerage industry, LAND ASIA GLOBAL PROPERTIES NETWORK (LAGPN) is supported by a solid, diversified senior management team with strong network base here and abroad. Its core functions include marketing of subdivision projects, townhouses, condominiums and brokerage of prime real estate properties. LAGPN is currently the marketing arm of stellar performer developers such as Cebu Holdings Inc., Ayala Land Inc., Aboitiz Land, Citylights Garden, Hilton Towers, Filinvest Land Inc., Commonwealth Estate, Philippine Estate Corporation, Taft Property Ventures, among others. LAGPN utilizes an efficient, effective and multi-disciplinary approach to providing the best advice to clients. For more information about the housing projects presented in this website, please contact us. Our duly appointed Consultant shall be pleased to handle your inquiries and tripping services for free.